This article was originally published on April 14, 2014, by Haaretz. The full article can be found on their website here. 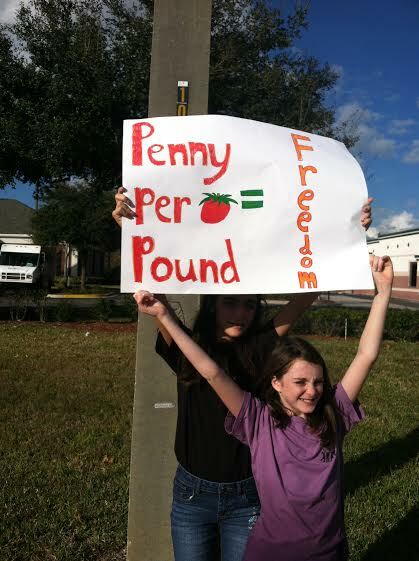 Slavery is a modern concern in the Southwest Florida tomato fields. As we celebrate our freedom this Passover, may we join the struggle against exploitative labor. Several weeks ago, students at our Martin J. Gottlieb Day School at theJacksonville Jewish Center welcomed over 70 migrant farm workers for breakfast. While the middle school students participate in weekly mitzvah projects and regularly volunteer in soup kitchens and food banks, this was not an instance of feeding the hungry. Instead, this was an example of welcoming in the oppressed. These migrant workers were a part of the Coalition of Immakolee Workers (CIW) based roughly four hours from Jacksonville, Florida. I heard from, saw and expressed the struggles of these workers firsthand last year when I traveled with a rabbinic delegation to Immakolee, sponsored by Truah: The Rabbinic Call for Human Rights. The Department of Justice refers to Southwest Florida as “ground zero for modern slavery.” In fact, according to U.S. Attorney Douglas Molloy, anyone who has eaten a winter tomato has eaten a fruit picked by a slave. While I did not witness slavery in the tomato fields upon my visit, I did hear story after story of exploitation. In the most extreme cases, there was modern-day slavery, the last case tried as recently as 2008. If slavery is the extreme end of a continuum of abusive and exploitative labor practices, the CIW fears that without serious changes, modern day slavery will continue. Some migrant workers had been enslaved to growers and crew leaders through coercion, force, fraud and debt. Most though are exploited through cheap labor: being paid by the amount of pieces picked, 50 cents for a 32-pound bushel of tomatoes. This bushel will cost the consumer roughly $81 in the supermarket, yet the migrant workers have been paid this wage since 1978. Refusing to be exploited, refusing to deal with the day-to-day threat of modern-day slavery, the CIW, founded over 20 years ago by Latino, Haitian, and Mayan Indian farmworkers, launched the Fair Food Program. This campaign encourages corporations, restaurant chains, and supermarkets to sign on and agree to pay a penny more per pound of tomatoes in order to improve wages for workers, but, most importantly, to improve working conditions. Such a change doesn’t just guarantee that workers will finally be paid a minimum wage, but it does guarantee the protection in the field from safety concerns, threat, assault and sexual abuse. They were touched when we explained to them that we would be placing tomatoes on our seder plates this year during the Passover holiday in recognition of their efforts and as a reminder of the work still to be done. Ironically, we read in the Haggadah during the Passover seder, “this year we are slaves. Next year, may we be free people.” The holiday that celebrates the Jewish people’s freedom from slavery in Egypt still acknowledges the exploitation and enslavement of so many in the world around us. It is our responsibility and task to not just praise God for our freedom, but also to act as God’s messengers and fight for freedom for all. The tomato on the seder plate acknowledges the continuity of our narrative. Our fight for freedom did not end when we crossed the split Sea of Reeds. Our fight for freedom continues. There is a new day in the tomato fields of southwest Florida, with many large corporations joining the Fair Food Program, most recently Walmart, the United States’ largest supermarket chain. The CIW – and our Middle School students who join in their fight for equality and freedom – believe now is the time for change. We celebrate freedom and continue to fight for freedom for all. We fight for Wendy’s and Publix and all restaurants and supermarkets to join the Fair Food Program. We see the tomato on our seder plates and remember the work we still have to do, so that we can one day truly celebrate at our seders that we are all free people. Today, December 10th, is the annual International Human Rights Day, dating back to 1950 when the United Nations General Assembly voted for such a day to bring to the attention ‘of the peoples of the world’ the Universal Declaration of Human Rights. We don’t simply acknowledge Human Rights Day. We don’t just celebrate Human Rights. We act. I previously mentioned how the Jacksonville Jewish Center celebrated Human Rights this past Shabbat, as part of T’ruah: The Rabbinic Call for Human Rights’ Human Rights Shabbat. More Impactful though then our communal Shabbat experience was participating in an action for social justice and Human Rights with the students of the Martin J. Gottlieb Day School on Friday, December 6th, in preparation for International Human Rights Day. Every Friday afternoon, the students of the Martin J. Gottlieb Day School Middle School end their week with a “mitzvah project,” a volunteer activity that emphasizes the Jewish imperative to participate in acts of social action and social justice. An important lesson for our Middle School students is understanding the difference between social action and social justice, understanding the difference between helping those in need by providing them with something, and advocating for a societal change and policy shift to fulfill God’s demand in Deuteronomy 15:4 that “there shall be no needy.” Both are necessary and equally important if we are to be God’s partners in creation. I spent this past year sharing with these students my previous experiences as part of a T’ruah rabbinic delegation to Immakolee, Florida. Immakolee, approximately four hours from Jacksonville, is home to America’s tomato fields. 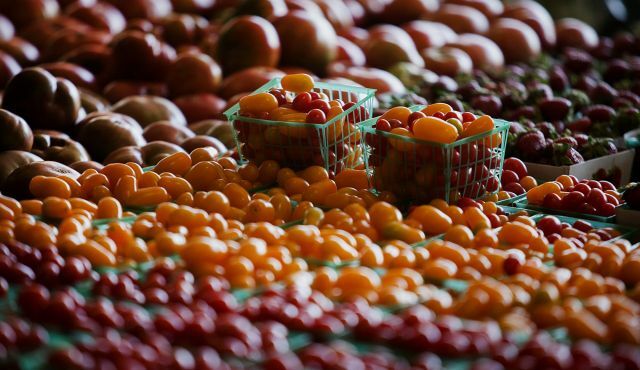 A large percentage of the fresh tomatoes we eat come from the southwestern part of our state. Upon arriving with other rabbis to Immakolee, I learned about the horrors that migrant workers in the fields have previously dealt with: there have been instances in which the farmworkers were enslaved to growers through coercion, force, assault, fraud, and debt. The Coalition of Immakolee Workers (CIW) has worked hard to put an end to such practices in surrounding tomato fields through the Fair Food Program. Having corporations commit to participating in the FFP is a sign that they too are committed to human rights and that their produce is just. As CIW explains, slavery is the extreme end of a continuum of abusive and exploitative labor practices. The Fair Food Program strives to eradicate slavery and such exploitative practices from our midst. The top five fast-food companies in the nation are: McDonald’s, Burger King, Subway, Taco Bell, and Wendy’s. All but Wendy’s have signed on to participate in the Fair Food Program. Wendy’s has not only refused to sign on; they have refused to sit down with the CIW and hear about the exploitative practices that they are supporting by continuing to buy such tomatoes. After spending several months learning about the Coalition of Immakolee Workers and the plight of the migrant workers in these tomato fields, our students took action to make a change. Our students discussed the importance of participating in such an action. Although Wendy’s is not kosher and thus, it is not a restaurant that we as an institution would eat in, it is a corporation that is a staple of our nation. Furthermore, it is a restaurant that stands for quality, respect, and doing the right thing. If they are not taking a stand for human rights, then we must. 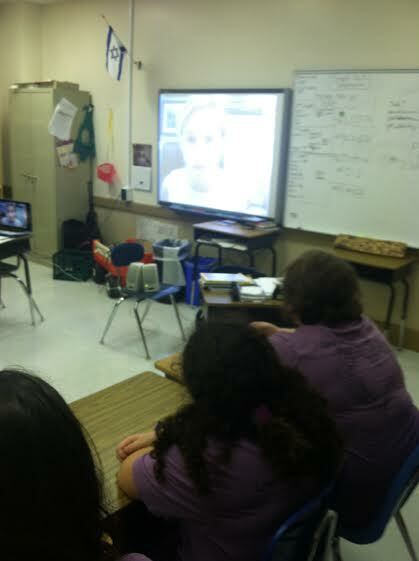 Our action began by skyping with representatives from CIW ally, Interfaith Action. Such a conversation (even if it was over the internet) empowered our students and gave context to the action they were to participate in. We then discussed talking points and made posters and signs to prepare for our trip to a local Wendy’s. We would never put our students in a dangerous situation. We ensured that there was proper parental and staff supervision. Additionally, we also called the restaurant ahead of time. Our task was not to be a menace. Our task was to raise awareness and engage in meaningful conversations to create change. The manager of the restaurant was aware that we were coming and was happy to meet with us and hear our students express their concerns about the exploitation of workers in Florida tomato fields. 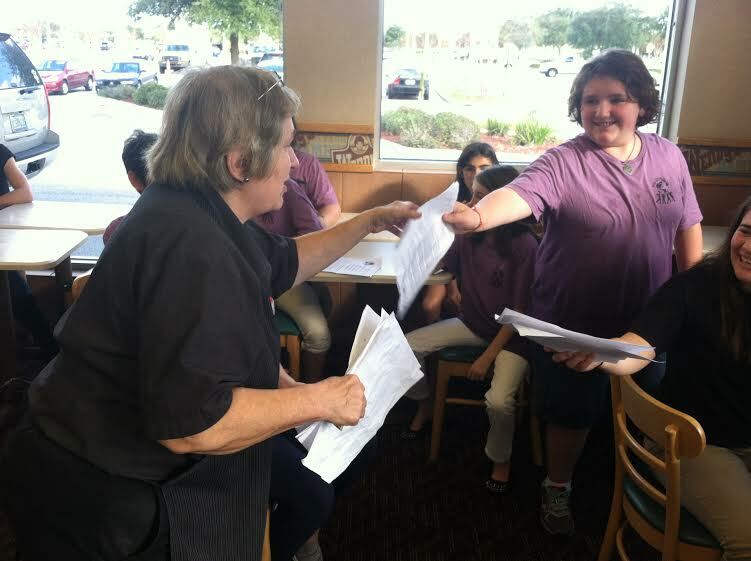 After explaining to the manager the need for Wendy’s to join the Fair Food Program, our students handed her signed letters from T’ruah, urging her to pass the letters along to her bosses and the corporate office. Our voices were heard and she assured us that she would speak to the corporate office and share our concerns. aware that we would be participating in such an action outside the store and welcomed it, emphasizing our right to educate and our freedom of speech and expression. 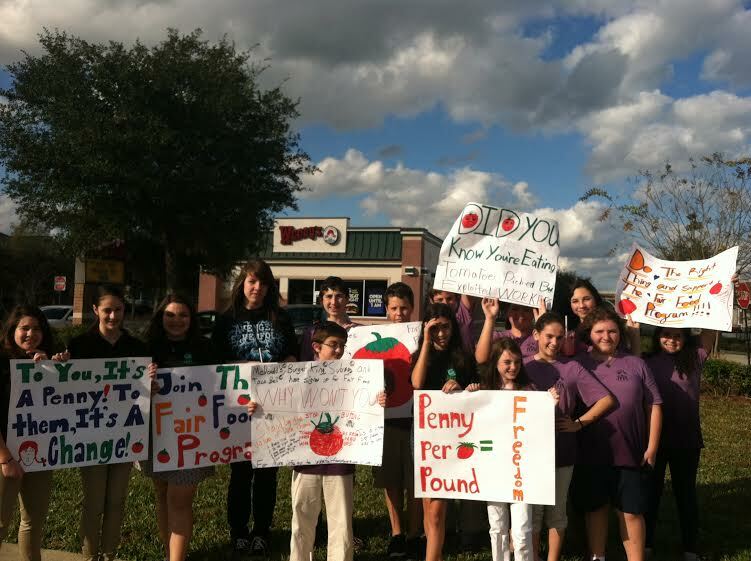 As cars and individuals passed by, we made them aware of the Fair Food Program and the need for Wendy’s to join! Our students felt inspired. 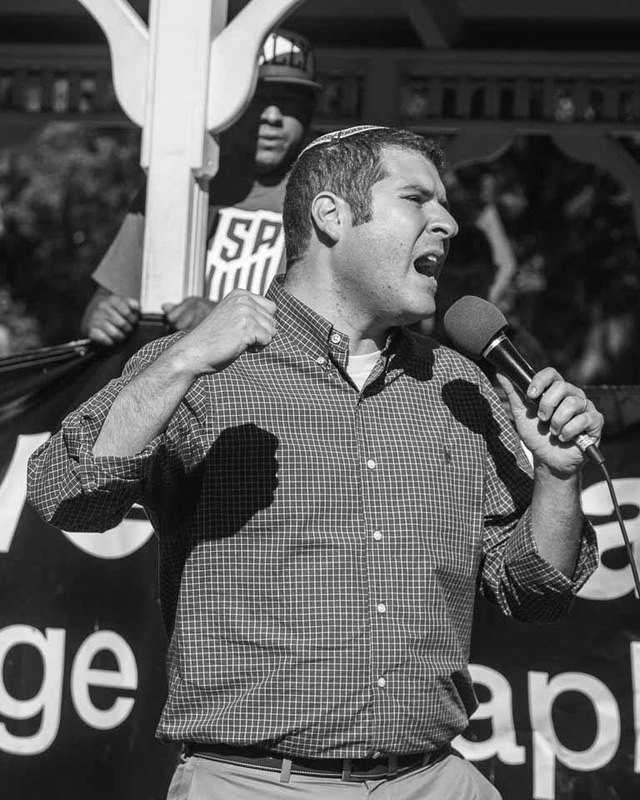 As a rabbi, I was even more inspired, watching them take action, prepared to fight for the rights – for the Human Rights – of other individuals. This is a cause that may not have directly affected them, but it very much did because they understood that we are each made in God’s image so our lives are all sacred and interconnected. This was just one afternoon and one action, but it was an afternoon that inspired me, as I now believe that these Middle School students – these future leaders of the Jewish community – will continue to not just learn of our tradition, but also live the ethics and values of our tradition and ensure equality and Human Rights for all. The American Jewish community has stood up for the Human Rights of others for as long as we’ve been a part of this country. Taking such a stand in our community is often highlighted by Rabbi Abraham Joshua Heschel marching arm-in-arm with Dr. Martin Luther King Jr. from Selma to Montgomery during the Civil Rights Movement. Taking a stand and participating in social justice issues is what it means to be a Jew. Rabbi Heschel famously shared that when he was marching with Dr. King, he was “praying with his feet.” On Friday afternoon, our Middle School students took a stand for Human Rights and prayed with their feet. Celebrating Human Rights and mourning a champion of Human Rights. 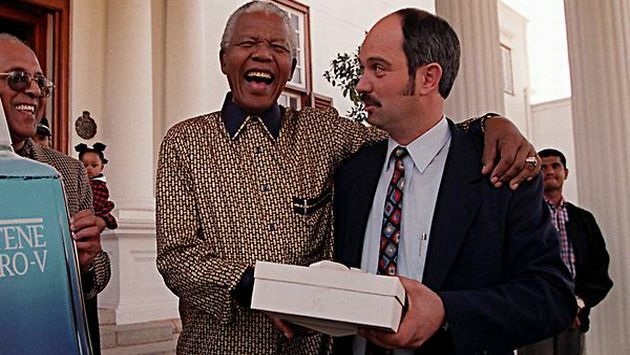 More remarkable to me than Mandela standing up for Human Rights, for his own rights, were those who eventually joined him in his fight: 18-year-old Christo Brand was a white prison guard at Robben Island, in charge of watching over prisoner Nelson Mandela. He believed the white man was superior and didn’t hesitate to share his pro-apartheid views. 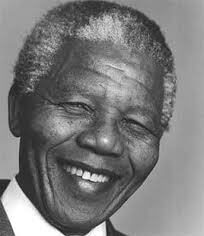 But throughout their relationship, Brand began to believe in the Human Rights that Mandela was fighting for. He developed a friendship with Mandela, smuggled him food while in prison, and transferred to Pollsmoor Prison when Mandela was moved there to continue to watch over him. And while it was truly revolutionary that Mandela’s prison guards were sitting in the front row for his 1994 inauguration, Mandela, once freed, would visit Brand in his home and play with his infant son. When Mandela retired from politics, his education fund awarded a scholarship to Brand’s now grown son, to study, and fight for Human Rights as well. Brand, the white prison guard, learned that it too was his responsibility to fight for the human rights of his friend, his brother. So too in our country, we remembered and acknowledged taking a stand for Human Rights this past week as we marked the anniversary of the beginning of the Montgomery bus boycott. 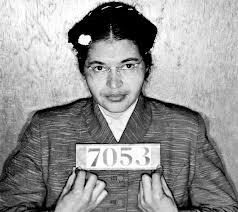 When Rosa Parks refused to give up her seat to a white man, because all the other seats on the bus were occupied, she was arrested on December 1st, 1955. This event set off a year-long boycott of public transportation among Montgomery’s African-American population, many of whom were regular commuters on public transportation. They carpooled, and often walked for long miles in sweltering heat and pouring rain. Rosa Parks refusal to give up her seat 58 years ago this week was the catalyst for such a boycott. I am in awe of Parks’ courage and strength. Yet, I am also in awe of the courage of those who joined with her and supported the bus boycott. Rabbi Seymour Atlas served Montgomery’s Agudath Israel Congregation during the 1950’s. A photo appeared in Life Magazine with Rabbi Atlas standing side-by-side with an African-American peer who was participating in the boycott. Immediately following that, he gave a Shabbat sermon suggesting that the Jewish community as a whole participate in the Montgomery bus boycott and refrain from using public transportation. I completely understand why he would do so. After all, I always learned that the Jewish community was immensely involved in the Civil Rights Movement. Yet, this was Montgomery, where the city as a whole, including the vast majority of its Jewish community, supported segregation. Congregants at Agudath Israel wanted Rabbi Atlas to ask Life Magazine to retract the picture taken of him, calling it an error. He refused. And when he publicly supported the bus boycott, he was relieved of his duties as rabbi at Agudath Israel. Yet, that too did not stop him. He continued to be involved in the Civil Rights Movement. He continued to support the bus boycott. He continued to take a stand on an issue that did not directly affect him, but affected him simply because he is human, because Rosa Parks was his sister. He continued to take a stand because the issue of Civil Rights was really an issue of Human Rights. We recognize the importance of taking a stand for Human Rights, taking a stand, not just for us, but for others as well. For taking a stand for others is taking a stand for ourselves because all of our lives are interwoven and connected. A successful right hand man of Pharaoh, Joseph has come a long way from being picked on and bullied by his siblings, being thrown into a pit, sold into slavery, and sent in prison. Now that he controls the wealth and crops, his brothers travel to Egypt and approach him, asking for food during the famine. We find at the end of Parashat Mikketz that after being bullied in his youth, Joseph becomes the bully. He places a goblet in younger brother Benjamin’s knapsack, only to find it in there moments later and accuse him of stealing it. Joseph demands that Benjamin become his slave in return while the other brothers may return to Canaan. The beginning of Parashat Va-yiggash, which the Jewish community read this past Shabbat, is the reason we do what we do when it comes to standing up for Human Rights. Judah, the same brother who suggested selling Joseph to the Ishmaelites only chapters ago, takes a stand. He calls out to Joseph and demands that Joseph enslave him instead of Benjamin. He cannot live a free life if his brother is not free. He cannot appreciate his rights if his brother’s rights are taken from him. Instead of just groveling, Judah takes a stand. How could he return without his brother?! Who is he without his brother?! He could not imagine living life to the fullest while his brother is enslaved. So he – who is free and is not being penalized at all – takes a stand for Benjamin. He’s willing to sacrifice himself for another. He’s willing to take a stand for his brother. In fact, standing up for Human Rights is how the Torah portion begins: Va’Yiggash Alav Yehudah. And Judah went up to Joseph. We refer to the parasha by this first word: Va’Yiggash: and Judah went up. And Judah stood up. And Judah took a stand. But as I learned from my friend and teacher Yael Hammerman, the Hasidic Rabbi the Sfat Emet suggests that this means something more: he translates this as “And Judah came close to him,” and clarifies that the “him” is not only Joseph. Judah came close to himself, came close to Benjamin whose rights he was fighting for, for Benjamin’s rights were also Judah’s rights, and in this courageous act of taking a stand, he also came close to God. While the Jewish people are called the Children of Israel (of Jacob, Judah’s father) in the Torah, the term, Jewish, and Judaism, comes from the fact that we are the People of Judah. We settled in the land of Judea, represented by the strong lion of Judah. Thus, to identify as the Jewish people, the people of Judah, is to proudly declare that we are a people who stand up for Human Rights. There are so many areas where we must continue to fight for Human Rights. They happen in every corner of the world, and they happen in our own backyard. All we have to do is open up the newspaper, and be willing to open up our eyes, to realize that we have a responsibility to take a stand for the rights of another. We must be willing to take a stand for that is what our tradition teaches us, and urges us, to do. Find your cause. Find your fight. Step up. Be a voice for the silent and stand up tall for the downtrodden. The United Nations’ Universal Declaration of Human Rights states: All Human beings are born free and equal in dignity and rights. They are endowed with reason and conscience and should act towards one another in a spirit of brotherhood. Or to put it more simply, we are all, BTzelem Elohim, made in the Image of God. As a congregation and community, we did not just observe Human Rights Shabbat. We celebrated Human Rights Shabbat. We celebrated our proud history of taking a stand for Human Rights. We celebrated being a voice for morality. In the spirit of Human Rights leaders Nelson Mandela and Rosa Parks, may their memories be for a blessing, but also in the spirit of Christo Brand – Mandela’s prison guard who became his supporter and friend – and in the spirit of Rabbi Seymour Atlas – who lost his job because he stood up for what was right – let us stand up for justice and Human Rights. Let us participate in an act that is so engrained in our faith and tradition. Let us, like Judah, stand up for the rights of others, for we are all brothers and sisters. In doing so, we bring ourselves closer to all of humanity, we bring ourselves closer to ourselves, and we bring ourselves closer to God.